Nexo Knights, Clones, Spehss Beerines, and Vikings! Nexo Knights, defenders of Knighton, pupils of Merlok 2.0. At their best when powered up by Nexo Power shields, and while mounted on their JetHorses, these Knights are all formidable fighters. An upgrade to the standard Heavy Armor, the Ultimate Armor boasts 4 studs on the back to mount special equipment packs. Each Power Shield brings with it a Supernatural d10, keyed to a particular Cliche; Mace rain gives an Area Effecting Damage die, Super Speed gives a Movement die, etc. 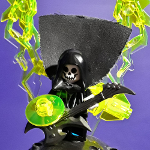 More things to come in future posts! 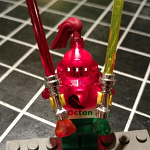 Re: Nexo Knights, Clones, Spehss Beerines, and Vikings! 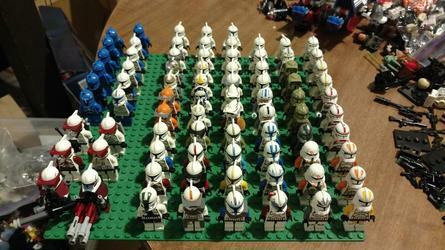 The Grand Army of the Republic, also known as the Clones, is generally populated by the usual statcarded minifigs, but some are specially trained. 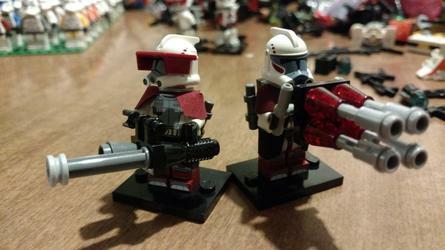 Army ability - Execute Order 66: +1 CP per Clone. When part of a squad of 4 or more, Clones give off an aura of Anti-Heroism with a radius of 1dX, where X is the amount of Clones in the squad, rounded down to the nearest die, up to 12. This is rolled on the beginning of the opponents turn, with the result lasting until either the amount of Clones changes, or the opponent goes again. Any Hero, including allied ones, caught in this aura becomes unable to call Redshirts to take damage for them. ARC troopers are among the best, brightest, and most creative of the Clones. Clone Commandos work best in their 'pods' of 4, and work as the assassination and special ops members of the army. RedRover wrote: Move post to armory? Well armory is for bricks and armies and the like this is mostly rules so it fits more here then there i would guess eh? I would not be opposed to that, if the armory is the best spot. I wasn't sure which subforum would be the best, as while this is describing armies, they aren't my personal faction, and are more like bonus statcards and equipment for existing ones. Vason wrote: I wasn't sure which subforum would be the best, as while this is describing armies, they aren't my personal faction, and are more like bonus statcards and equipment for existing ones. Ah! Carry on then, ignore me. 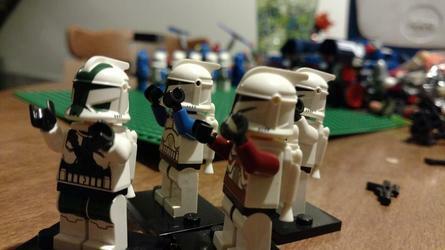 I've never seen clones look so cool. Members of the order Aledeptus Astoutes, these highly skilled warriors are the custodians of the Holy Emprah's Beer. In the age of Grim Darkness, all beer is sacred. As part of their daily rituals, the Space Beerines pray to the Kegs for a great buzz that day. The Holiest of Holies is, of course, the Orange Transparent Keg. Kept within is the beer they drink only on the day of battle. Under the watchful eye of the Farce Commander, the Beerines take a draught via Holy Kegstand. 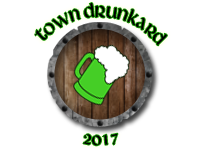 Drunken Hijinx - Army Ability, +1CP per Beerine - Whenever a Beerine makes a Skill Roll, also roll a d6. If it comes up 3-6, add that to the skill roll. If it comes up 2-3, subtract it. If it comes up 1, the Beerine is overcome by the effect of the Beer. He becomes Disrupted as he is forced to use his Action to upchuck the holy liquid, and from then on is no longer affected by Drunken Hijinx. Supernatural Dice - 3d6, 1d10 (18CP) - Used in combination for Range and Damage, calling down an Alestrike directly from the Holy Brew Kettle. Dice contained on the Grey elements and shaft of his Power Hammer. 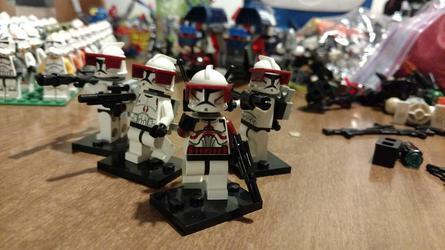 runnybabbit223 wrote: I've never seen clones look so cool. Then I'm glad to introduce you to their Badassery! The Facre Commander should be the Brewmaster. Other than that, this is some of the best fluff that I've seen in a while. Zupponn wrote: The Facre Commander should be the Brewmaster. Other than that, this is some of the best fluff that I've seen in a while. Vikings are the most badass fighters around. Strong, hardy, and each one bound to the others like family, there are few factions more capable of such general destruction and mayhem. Having trained so close together allows Vikings to perform much better in Squads than many others. In addition to the vast majority being Heavies, and thus able to form Shield Walls, the Walls they form are generally better organized. Skjaldborg - Army Ability, +1CP per Viking - Vikings on a Squad plate only require 2x2 studs to form up when equipped with Melee weapons. Also when Skirmishing, Vikings in both the front and and second rank of a Shield Wall may make Melee attacks as if they were all on the edge of the plate. Berserkers are the secondary component of a Viking army, able to cut swathes through enemy armies like a hot knife through butter...or a huge axe through ABS, as the case may be. OverCompensating - +1 CP - An add-on ability to Compensating, this allows a Heavy be counted as a Size 2 creature for purposes of Weapon power, rather than a minifig. 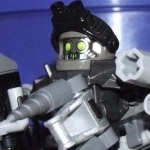 This allows a Berserker to, for example, wield two 2" weapons at once without the usual -1" move penalties of a Two-Handed weapon (the weapon Use ratings still correspond to Minifig weapons, however.) They also do not take the usual movement penalties associated with the usual Compensating. However, as they are so angry about the things they are Overcompensating for, an Overcompensating unit is so focused on killing things directly that they never wield Ranged weapons, Shields, or Armor. Indeed. I originally put the band together as a replica of the Viking reenactment group I'm a part of. Each one has a unique face and clothing, as well. Buuut, how do clone commandos' SN backpack dice work? Is that their extra armor or weaponry or what?